Washroom Washroom has announced an annual turnover of £16.2 million. The washroom manufacturer cited the popularity of its exclusive Iconic Collection as the key to its success, which has resulted in a seven per cent increase in turnover compared to the previous year. 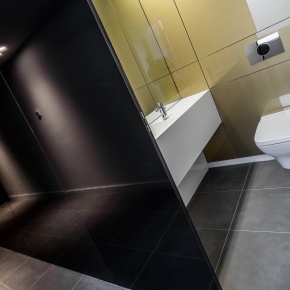 Created for high specification washroom and changing areas, Washroom noted a 25% increase in projects using the IconWashroom Washroom announce annual turnover and success in commercial marketsica Collection last year alone. The collection has been used on a diverse range of projects across the leisure, education and health sectors, however has been most successful in the commercial market. The Iconica Collection has been especially popular when used in conjunction with Washroom’s Cre8 Joinery offering. Together with Cre8 Joinery, Washroom has completed a number of high profile, high specification offer projects over the past 12 months. Projects include The Bower at Stockley Park, and the current ongoing works at 4 Kingdom Street, which features an off-site mock-up aspect, that is due to complete in the coming weeks. In order to meet the increased project demand, the company has expanded its design team with more CAD technicians and designers now working on the design and modelling on projects across all sectors.